JINMO's 108th solo album, "Viano Vorte". 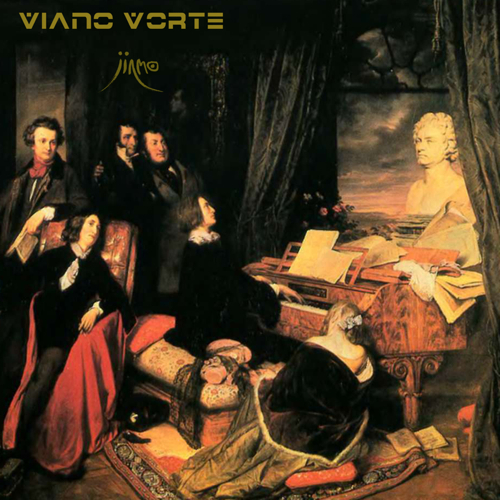 The title "Viano Vorrte" is coinage based on old name for piano. "Valley Marinerisu on Mars surface that is configured with the sound emitted by 12 pianos. The feedback running through there freely, ultrafast and powerful such as dragon flute. Screeching his favorite chair, Glenn Gould sympathizes with piano. He put his face on the keyboard and sings humming to the piano. Screeching his edgy chisel, Munakata Shiko sympathizes with woodcut. He put his face on the printing block and sings Warship March. Not only the posture on their work, also the attitude of their soul possessed with something... the intensity and the devout, it is so beautiful. On this album making, I sympathized with computer, nestling my face against the waveform data, singing to blowing wind and dazzling light, screeching my trackpad. I played resonance in virtual Valley Marinerisu with my 12 virtual pianos of the album "Piano Genome" and my virtual guitar." i.e. virtual piano and + virtual guitar work by JINMO. My hands are too less to play piano pieces that I want to play. It is not my fault, but if I determined to abandon it for established fact, I think it is negligence as an expressionist. The genome is defined as "genetic information essential to organisms being organisms". Human A and B, their genetic information are not completely identical. Although the differences appear as personalities that distinguish the two, the identity of the non-difference (genome) identifies them as the same human tribe. If there will be slight differences in the genome conversely, it is "something other than man." How do we define "guitar"? Classical guitar, folk guitar, electric guitar, MIDI guitar, etc...we recognize various guitar as "Guitar" in spite of the differences of their shapes, the principles of sound production, materials, the number of strings or the way of performance. The wooden instrument which has large body resonance and traditional nylon string to play with fingertips, and the seamless carbon graphite instrument that I use often, it converts string vibrations of steel-strings tapping into electric signals with electromagnetic pickup, it has no body resonance nor head. Nevertheless, to define them as same musical instrument called "guitar", there is something exists such as "Guitar genome". There is an ordinary wine glass. It is "tableware". Someone with intentions wet his fingertip with water and rub the rim of glass, then the glass emit a clear high tone. Tableware metamorphosed its genome into the instrument called "Glass Harp". "Stamps" for the collector, they are not tools for prepaid postage but they are priceless art pieces. The tools that should be used as murder weapon on the battlefield, sometimes they would be into national treasure swords. These identity of genome but also metamorphose, they are caused by the consciousness of those who get it. And this album "Piano Genome", it means "genetic information essential to piano being piano". My intention has beyond actualized-potential diverse differences, this album turned into piano solo. Originally, the piano was very different from the current one. Upright piano and grand piano, it doesn't seem the same from the volume, And the piano which has different frequencies, piano with multiple keyboards, specially developed piano for four-handed performance, electric piano to amplify the vibration caused by hammer electrically, etc. Strong lively feeling of performance, improvisation with direct access to emotion of the player, tactile impression like flesh and blood, huge dynamism of strength and speed control. Musical expression that keep expressing them on all aspects, transcending the limitations of player i.e. the number of arms or fingers.To express the feeling of live performance that I want, it is impossible by four?handed performance with watching out other player. It is absolutely impossible to play with pre-programmed MIDI information sequencers or automatic performance programs such as MAX / MSP, because they never sense the emotion of the player. Without the realization of the impossibility of "impromptu live performance by the player with 4 to 10 arms", there is no piano solo that I want. Technical trial and error were necessary. I surmounted the difficulties, I made this play possible. I will omit the detailed description for technical theory of programming because it is beyond the objective of commentary on the album and it is unimportant details to expression itself. In short, I set the assignment for handling various MIDI signals to each and every key on the keyboard of my PowerBook G4. Then I played PowerBook G4 vigorously as completely usual as I play the guitar solo at live venue. The instrument that I played on the recording, it was not grand piano. It was PowerBook G4 that the shape was totally different from piano. However, it was PowerBook G4 with "piano-genome". I appreciate to discerning Ms.HARI who listened to this untitled piano solo and gave the title "Piano Genome" as I finished playing. At the end, I always think that strong will of expressionist transcends his physical limitations. Massive roar of piano-genome and guitar-genome. Enjoy the JINMO's further evolved piano with dazzling light and blowing winds through the Valley Marinerisu on Mars in your brain.